I've been obsessed with chicken & dumplings since my 1st Cracker Barrel visit. In high school, I tried making them from scratch & failed miserably! I called off the quest for homemade chicken & dumplings... Until I discovered this super simple slow cooker version! 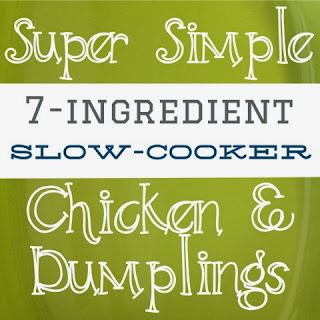 Very good, crazy easy, & makes awesome leftovers! The husband loves it, too! Put all ingredients (except the biscuits) into your slow cooker. Cover & cook on low 5-6 hours. 30 minutes before serving, use 2 forks to shred the chicken a little bit. Then, use kitchen shears to cut the biscuits into 1 inch pieces & put them into the slow cooker. If you don't have kitchen shears, just rip the biscuits with your hands. Fold the biscuit pieces into the mixture gently & cover. Cook for the remaining 30 minutes. Before serving, stir once more to distribute the dumplings.